Try our "HILOU PET" Dematting Rake and get rid of all that nasty mats, tangles and knots. Get healthy, shiny and well-groomed hair of your furry friend! Mats don't only make the coat look disheveled, but also irritate the skin and become a breeding ground for parasites. The pet starts scratching causing the mat to grow in size and the hair to get even more tangled. But don't panic! "HILOU PET" will help you to solve all your pet "hairy" issues with New Dual-Sided Dematting Comb! 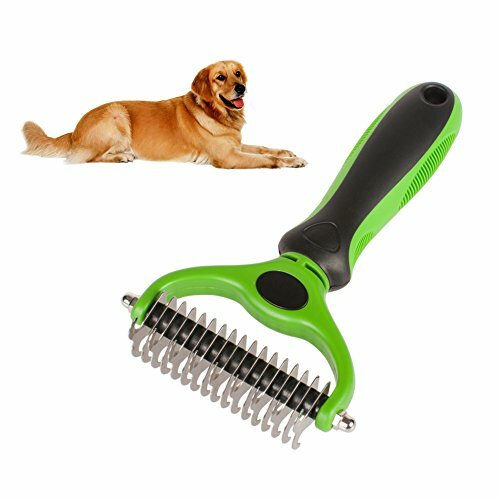 You'll get 2-in-1 grooming tool - Dual - sided comb has 9 teeth side for tough mats and tangles and 17 teeth side for thinning and de-shedding. Reduce shedding - Regular brushing removes excess dead hair from your pet's undercoat. What are you waiting for? As you see, we have thought everything out, our dematting tool is just what you need! 2-in-1 DUAL HEAD - Start with 9 teeth side for stubborn mats and tangles and finish with 17 teeth side for thinning and deshedding. Achieve faster and more professional dematting and grooming results. BUY NOW WITH CONFIDENCE - Unconditional Satisfaction Guarantee - ABSOLUTELY NO RISK TO YOU! We offer a REPLACEMENT PET BRUSH or REFUND if for any reason you are unhappy with your purchase! If you have any questions about this product by Hilou Pet, contact us by completing and submitting the form below. If you are looking for a specif part number, please include it with your message.